The Washington Post's Jonathan Capehart and the State Department's Nick Schmit open their home for a look at how the dynamic duo dwells. 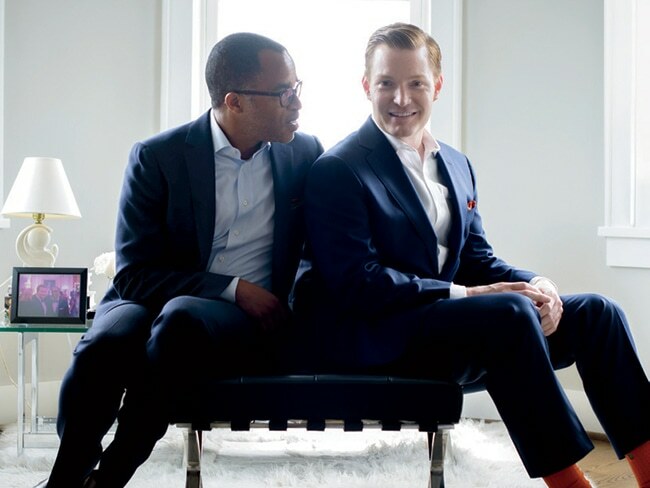 Nick Schmit (left) and Jonathan Capehart at their duplex in Washington. Five years ago, while Nick Schmit, the deputy chief of protocol at the US State Department, was traveling in Japan for work, he got a message from a friend suggesting he meet Pulitzer Prize–winning reporter and MSNBC contributor Jonathan Capehart. They were both single at the time, and the friend thought they would have a lot in common. She was right! 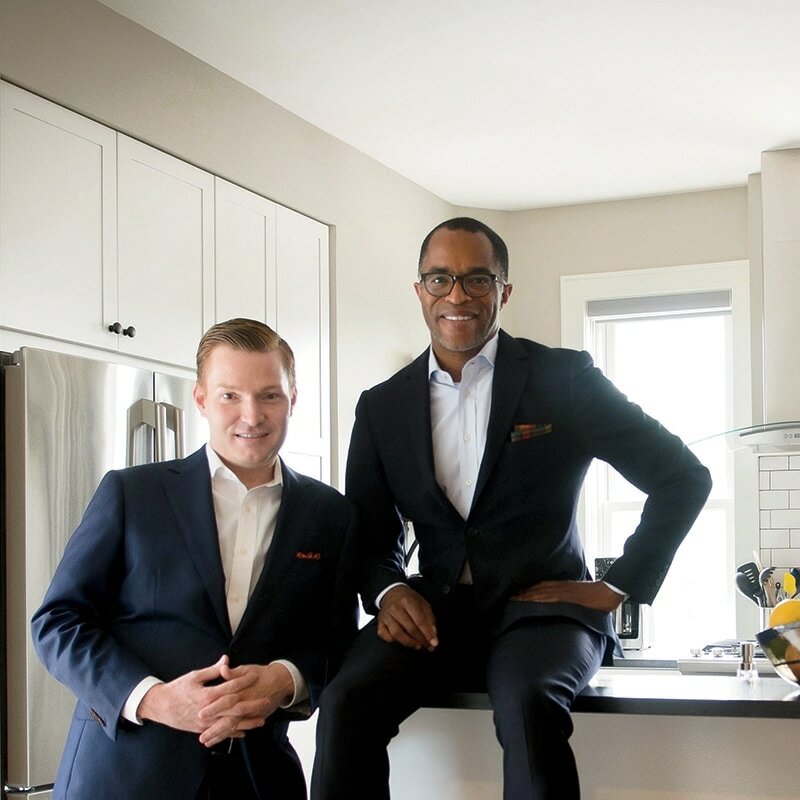 As Schmit and Capehart prepare to celebrate their fifth anniversary in November, this lively duo agreed to let Capitol File take a peek into their home to learn more about their happy, busy lives. You were introduced on Facebook by a mutual friend. Jonathan Capehart: I got this message from Jen on Facebook asking me, “Are you dating? I want to introduce you to someone.” Before I answered, I asked who, and she sent me Nick’s Facebook page. “Wait a minute! Isn’t that the same guy who you tried to set me up with six months ago?” Well, it was, but the timing wasn’t right the first time! 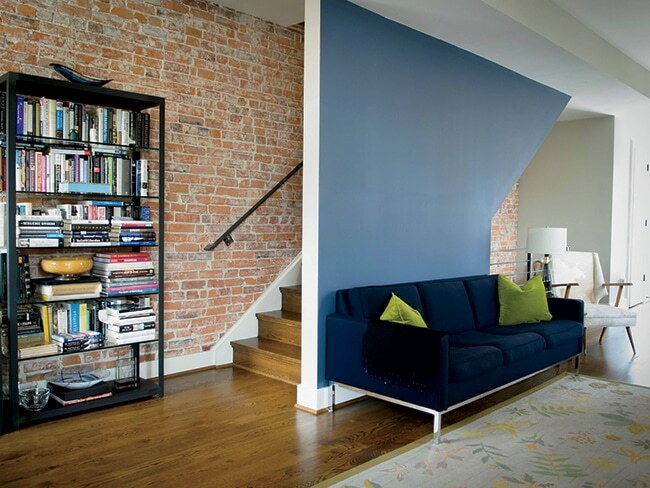 Different colors and textures on the walls divide the open ground-floor space into distinct areas. You both have high-profile and demanding jobs. How do you make time for each other? Nick Schmit: I think really being focused around evenings and eating meals together after working all day is our personal time. Even if we have something that we have to go to after work, either together or separately, we both ultimately try to meet up for dinner, whether it’s at home or out. And then on the weekends we’ll take one day to relax, sit down and read the paper, or run a bunch of errands. JC: Nick has been really wonderful. When we met, all I did was work, nonstop. On Sundays, I would sit inside my apartment the entire day, until maybe 6 pm, reading the papers and trying to figure out what I was going to write… to get a jump on Monday. He said to me, “Jonathan, I’m afraid you’re becoming a shut-in,” because all I did was go to work and do the TV thing and then come home. But you know, I guess that’s being a Cancer. We’re both comfortable in our shell, and I was most comfortable at home. Then he said, “You have a nice apartment, but you never have anyone over. You should have a party.” It was wonderful to be able to have friends over to entertain and just relax. Nick has been really good, really forceful about taking time for myself, so that I’m not constantly working. NS: Jonathan cooks one thing and that’s coffee. And sometimes oatmeal—don’t forget oatmeal. I love to cook, but cook much more in the winter. JC: If he doesn’t want to cook and we don’t want to go out for whatever reason, we basically starve. The next step in Schmit’s “master plan” is a house with a yard and a dog. Your apartment is beautiful. How did you pick it? JC: I’m the New Yorker who likes the doorman building and all of the things that come with that, and Nick really wanted to be in a home, like a place that’s more like a house. So we spent months looking at houses, looking at condos, and when we saw the place where we live now… the apartment was so beautiful. There are only two units in the building, so while the entire house is not ours, it feels like we are living in a house. It’s all part of Nick’s master plan to get us into a house so we can get a dog. NS: The next step is into our own house, definitely with a yard, and then we’ll get a dog at some point. Hmmm, first dogs, then kids? JC: It’s all part of Nick’s master plan!